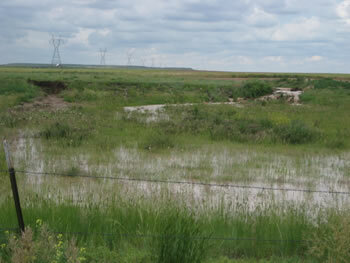 Seventeen hours after a June 22, 2009 thunderstorm, water was still rushing down intermittent Coalbank Creek and under Weld County Road 100. The creek carried storm runoff waters from and through areas where Powertech hopes to mine uranium. Evidence that flood water levels were much higher immediately following the storm can be seen in the muddy stream bed on the left. Uranium open pit mines produce radioactive tailings that are exposed to natural erosion. Tailings deposits are subject to many kinds of erosion. Due to the long half-lives of the radioactive constituents involved, safety of the deposit has to be guaranteed for very long periods of time. After rainfall, erosion gullies can form; floods can destroy the whole deposit; plants and burrowing animals can penetrate into the deposit and thus disperse the material, enhance the radon emanation and make the deposit more susceptible to climatic erosion. When the surface of the pile dries out, the fine sands are blown by the wind over adjacent areas. The sky has darkened from storms blowing up radioactive dust over villages located in the immediate vicinity of Wismut's uranium mill tailings piles. Subsequently, elevated levels of radium-226 and arsenic were found in dust samples from these villages. Weld County’s booming population coupled with their volatile weather of high winds, heavy rains, and tornados would seem to make Powertech Uranium’s proposed open pit uranium mine absurd. What may not be as obvious are how these same weather patterns impact in situ leach mining (ISL) for uranium, a process the uranium mining industry touts as benign since it takes place within the aquifer underground. There is no benign method of mining uranium. Concentrations of hazardous waste and radioactive materials are by-products of all uranium mining. The process of In Situ Leaching leads to the formation of many liquid and solid waste streams. These are produced from the bleed solutions, waste processing solutions, solid residues that build up due to the precipitation of minerals from the highly concentrated solutions involved, solid waste from the processing plant (such as contaminated clothing and equipment), and other normal wastes from industrial facilities. Uranium mining releases radiation. The mined uranium ore is radioactive, but not as radioactive as the elements always in association with the ore such as radium and radon. Radioactive elements and toxic heavy metals are the unwanted by-products of uranium mining, left behind within the aquifer or on the surface in tailings, evaporation ponds, dust particles, and radon gas emissions. The mining of uranium ores leads to the presence of radiation. This can be in the form of alpha, beta and gamma-emitting radionuclides formed from the uranium decay sequence. The principle radioactive elements released during In Situ Leach uranium mining are uranium, thorium, radium, radon, and their respective progeny (Tweeton et al., 1982; Kasper et al., 1979). . .The radium and radon are transported in the mining and processing solutions to the surface. When at the surface and the solutions are pumped to the retention pond, appreciable quantities of radon can thereby be released (Kasper et al., 1979). The radon gas can be transported in the direction of prevailing winds significant distances away from the mine, where radon will decay to a stable solid due to it’s very short half-life. All types of uranium mining must deal with the disposal of their hazardous waste and radioactive by-products. ISL uranium mining generates toxic wastewater. Methods of uranium mining wastewater disposal include: evaporation ponds; watering the surrounding area with wastewater called a land application, re-injection of the wastewater below the earth’s surface in a deep well injection; or uranium mining wastes, either dried residue from evaporation ponds or mined tailings, can be trucked away to a hazardous waste facility.